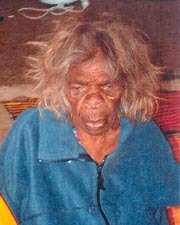 Born circa 1930 in the area of Karrkurritinytja (lake Macdonald), and is a senior Pintupi woman now living in Kintore, Central Australia. Makinti Napanangka commenced painting for the Papunya Tula Artists in 1996 but had already painted with acrylics on canvas during the Kintore and Haasts Bluff project in 1993 / 1994. Apart from an enforced break after having a cataract removed from her eye in 1998, she has continuously painted. Her art is characterised by a more spontaneous approach in illustrating the traditional iconography than that done by previous artists painting at Papunya. She often paints stories about the Kungka Kutjarra (Two Women), ancestors, whose pathways cover huge distances over hundreds of kilometres. These journeys over through the changing landscape include ceremonial sites and areas where food and water were found. Makinti’s style of art is quite different from that of her contemporaries and is not concerned with the dot style of artwork. Many of her works depict hairstring skirts (made from human hair), and belts worn by women during certain ceremonies. These are usually represented as parallel lines in distinct colours often yellow and oranges. Makinti Napanangka’s work is very popular and highly sought after. Awards: 1997, 14th Telstra NATSIAA; 2001, finalist in 18th Telstra NATSIAA. 2003 - finalist in the Clemenger Art Award at the National Gallery of Victoria. Collections: Art Gallery of New South Wales. Macquarie Bank Collection. Museums & Art Galleries of the N.T. National Gallery of Victoria. Queensland Art Gallery. Exhibitions: Individual Exhibitions: 2002 - Makinti Napanangka: Recent Paintings, Gallery Gabrielle Pizzi, Melbourne. 2001 - Makinti Napanangka: new paintings, Utopia Art Sydney. 2000 - Makinti Napanangka: New Vision, Utopia Art Sydney. Group Exhibitions: 2005 - Papunya Tula Artists, Gallery Gabrielle Pizzi, Melbourne. 2004 - Papunya Tula Artists 2004, Gallery Gabrielle Pizzi, Melbourne; Colour Power - Aboriginal Art Post 1984, National Gallery of Victoria Federation Square, Melbourne; Mythology and Reality - Contemporary Aboriginal Desert Art from the Gabrielle Pizzi Collection, Heidi Museum of Modern Art, Melbourne. 2003 - Emerge, Museum and Art Gallery of the Northern Territory; 20th Telstra National Aboriginal and Torres Strait Islander Art Award, Museum and Art Gallery of the Northern Territory, Darwin. 2002 - Recent Paintings by the Women Artists of Kintor and Kiwirrkura, Gallery Gabrielle Pizzi, Melbourne; Sprint Exhibition 2002, Scott Livesey Art Dealer, Melbourne; 19th Telstra National Aboriginal and Torres Strait Islander Art Award, Museum and Art Gallery of the Northern Territory, Darwin; Next Generation – Aboriginal Art 2002, Art House Gallery, Sydney; Paintings from Our Country, Tony Bond Aboriginal Art Dealer, Adelaide. 2001 - Dreamtime: the Dark and the Light, Kunst der Gegenwart, Sammlung Essl, Vienna; Desert Flowering:Aborignal Art from Private Collections, Manawatu Gallery, New Zealand. ;Palm Beach Art Fair, Palm Beach, Florida, USA. ;2001, Utopia Art Sydney; Art of the Pintupi Tony Bond Art Dealer, Adelaide, South Australia; Aboriginal Art 2001, Scott Livesey, Art Dealer, Melbourne Victoria ; Dreamscapes-Contemporary Desert Art, Mostings Hus, Frederiksberg, Denmark; Papunya Tula 20th Anniversary Exhibition, Chapman Gallery, Canberra, ACT; Pintupi Exhibition, Papunya Tula Artists, Alice Springs, NT; 19th National Aboriginal and Torres Strait Island award, Museum and Art Gallery of the Northern Territory, Darwin, NT; Kintore and Krwirrkura, Gallery Gabrielle Pizzi, Melbourne, Victoria, Australia; Dreamtime-Contemporary Aboriginal Art, Essi Collection,Vienna, Austria 2000 - Pintupi Women, Papunya Tula Artists, Alice Springs, NT. ; Melbourne ArtFair 2000, Royal Exhibition Hall, Melbourne. ; Papunya Tula Artists NOW, Utopia Art Sydney;Papunya Tula: Genesis and Genius, Art Gallery of NSW Framed Gallery, Darwin, NT; Gallery Gabrielle Pizzi, Melbourne, Victoria 1999 - Gallery Gabrielle Pizzi, Melbourne, Vic; Moet & Chandon Touring Exhibition, RMIT Gallery, Melbourne. Victoria, Australia. 1998 - Gallery Gabrielle Pizzi, Melbourne, Vic; 1998, Utopia Art Sydney; 15th National Aboriginal & Torres Strait Islander Art Award 1998, Museums & Art Galleries of the Northern Territory, Darwin, N.T. ; 14th National Aboriginal & Torres Strait Art Award,RMIT University, Melbourne, Gold Coast Art Gallery, Surfers Paradise, Queenslad; Araluen Art Centre, Alice Springs, N.T. 1997 - Museums & Art Galleries of the Northern Territory, Darwin,; The Desert Mob Art Show, Araluen Art Centre, Alice Springs, N.T. ; Gallery Gabrielle Pizzi, Melbourne, Vic. 1996 -Papunya Tula Women: first exhibition outside Alice Springs,Utopia Art Sydney; Museums & Art Galleries of the Northern Territory, Darwin, N.T. ; Womens Show, Papunya Tula Artists Pty Ltd, Alice Springs, N.T. 1995 - Minyma Tjukurrpa, Kintore/Haasts Bluff Canvas Project, Tandanya National Aboriginal Cultural Institute, Adelaide.